1. Preheat the oven to 200°C, gas mark 6. On a lightly floured working surface, roll out the pastry to a round about 5mm thick, gently lift the pastry and use to line a 25cm Waitrose Cooking Fluted Flan Tray, and trim the edges. Cover with foil and half-fill with baking beans. Bake for 10 minutes, remove the foil, and bake for 5 minutes more. 2. Reduce the oven temperature to 180°C, gas mark 4. Beat together the butter and sugar until light and fluffy. Beat in one egg at a time, then fold in the ground almonds. Spoon this mixture into the pastry case and spread over evenly. 3. 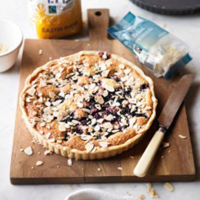 Drain any liquid from the blackberries and arrange over the almond mixture, scatter the demerara sugar over the top, then bake for 40-45 minutes (until the frangipane is puffy) and scatter with the flaked almonds and leave in the warm, switched-off oven, with the door ajar, for 15 minutes. Serve warm or cold. This recipe was first published in Tue Oct 15 12:11:42 BST 2013.